Could you also add a configuration options to activate the digital output 1 of an arduino for an adjustable time (1 to 10 minutes) upon REM blink detection? Elite. What tACS device did you use for that recording? And did you feel more self-aware!? Both are medical devices and have a built in current limit feature and complete electrical isolation from the mains…. Thanks for the links… still reading the specs on the arduino. I could always just send a mouse click if you leave the mouse over the Start button on the Estim program if all else fails. May I ask how much they cost and if it is possible for someone who is not a medical professional to get one? I also got a Zeo headband for better REM detection and a Basis B1 to check if the Neurosky REM algorithm matched. The Basis REM is most accurate. It looks like it should chart the Stage channel. I wonder if the LSD file logs 2 as the sleep stage during REM? You probably won’t be able to see it in the printout on the thousand scale. But it might be in the LSD file. Then all I would need to do is add a Zeo REM channel that triggers the tACS when the Stage channel is on 2? Do you have logs of the Zeo and NeuroSky comparison? That would be invaluable for me to improve the algorithm! Pro tip: if you right-click on that graph, you can add a note with “Triggered tACS 40Hz” at 18:39:36. Sure… I will add a configuration option for the arduino COM port and the length of time to send a message to it… defaulted to “1”. Then when it plays the audio track, it will also send “1” to the arduino, or whatever has been configured. Do I send the message to the COM port every second for 1 to 10 minutes? I am a student and I have a project for the Science of the Engineer section. In this project i use Arduino for receiving data from the headset Mindwave. I’d use the attention and eye blinking signals to control a servo motor but I can not get this data! 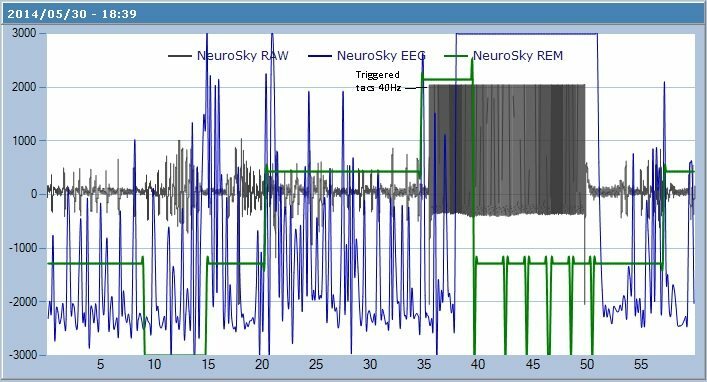 Can you access the raw EEG data? If it spikes; it is probably a blink. What code are you using to receive the attention data? no, i cant accces raw EEG data ! //Get the number of bytes (characters) available for reading from the serial port.